Please buy The Power of Validation from Amazon.com. 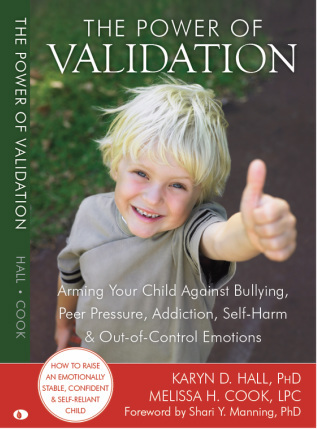 The Power of Validation was written in response to how the Validaiton concept affected my own parenting. As I started applying Validation to my parenting, I began to notice a dramatic difference in how my children responded to me. Both my husband and I began to use Validating Parenting and saw an even greater change. I believe you will too when you read the book and apply the simple concepts. When you Validate a person's feelings, you are basically telling them that what they feel is valid, logical and makes sense. Validating Parenting is a concept that takes Validation and helps extend it to the practice of parenting. The book is a mix of stories and theory and helps the reader to understand in great detail how to apply Validating Parenting to their own parenting styles. I am available for speaking engagements on this topics. I speak regularly at elementary schools in Houston, such as Hunters Creek Elementary, Memorial Drive Elementary, First Baptist Academy, National Charity League Functions, and The Second Baptist School. I have also presented this topic in conferences, CEU's, local chapters of NAMI and Parent Connections. Please visit my blog for a stream of Validation entries! I will be posting on a very frequent basis.